As Constable Dogberry once observed, “Comparisons are odious.” So do what you can to resist pitting Allison Gregory’s new work, Motherland, in your mind against the play that inspired it, Bertolt Brecht’s Mother Courage and Her Children. The former, a contemporary tale of a wily, maternal ghetto merchant, has plenty to recommend it, but it is lightweight stuff compared to Brecht’s nihilistic anti-war drama, widely considered one of the great plays of the 20th century. Instead of the 17th century Thirty Years’ War that Brecht chose as his stand-in for World War II, Gregory sets her play today in “an ignored lot in a hopeless corner of a large American city” amid the raging War on Poverty. However entrepreneurial Mother is, selling everything from fireworks to condoms out of her dilapidated, stationery food truck, her main concern is the safety and survival of her three grown children. There’s Destin I (Troy Davidson), her older son whose ambition puts his life in jeopardy as a police cadet; Destin II (Roderick Randle), who also yearns to be a man in uniform, but at McDonald’s; and daughter U-Neek (Shein Mompremier), a deaf-mute innocent who attracts the attention of a low-life crook from the hood. In the Brecht, the title character is usually a physically imposing Earth Mother type, all the better to push her cart of wares throughout the deadly war zone. At FAU Theatre Lab, Mother is played by bantamweight Karen Stephens, but she quickly establishes herself as a feisty, combative force of nature, ready to do whatever it takes to protect her family. Crafty and tenacious, she towers over the production at all times. Director Matt Stabile takes his cue from Brecht, relating the tale of survival with a presentational style just removed enough from naturalism to emphasize that we are watching a play. This artifice is underscored in Gregory’s text by the oral recitation of stage directions and the gloom is leavened by sporadic bits of dark comedy. Motherland avoids the musical interludes that Brecht favors, though Stephens does occasionally break into Oklahoma’s “Oh, What a Beautiful Morning,” an ironic song choice for her miserable existence. Early on, a pair of cops (Michael H. Small, Jordon Armstrong), standing in as symbols of white authority, arrive on the scene to hassle Mother over her lack of a business license. Not only does she talk her way out of such bureaucratic niceties, but the policemen’s demeanor – and guns – attract Destin I to a law enforcement career of abusing the impoverished. Both actors take on added supporting roles – Small as a vendor of indeterminate accent and Armstrong as a shiny-suited real estate wheeler-dealer, bluntly named Opportunity. As you might imagine, matters do not go well for Mother and her family, but their fate is nowhere nearly as severe as the violence and death that befalls Mother Courage’s clan. In contrast to Brecht, Gregory is a relative optimist. Even when bruised and battered, Mother trudges on. 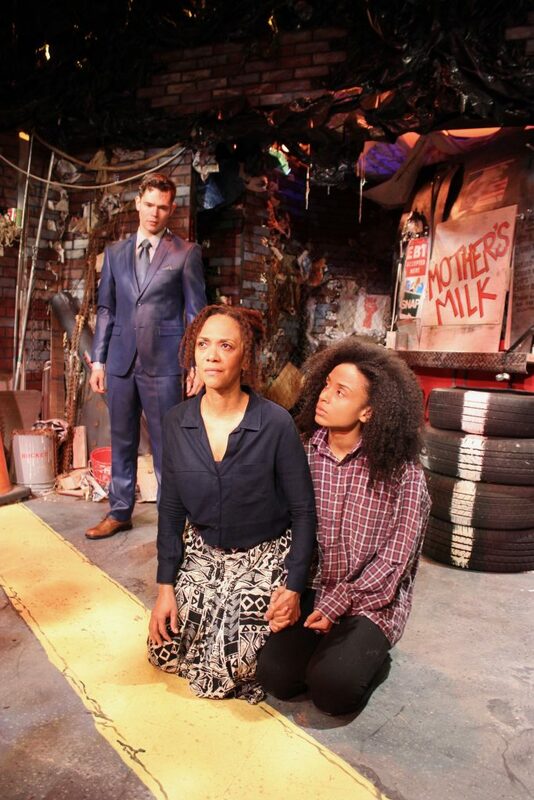 The final play of FAU Theatre Lab’s first season of full productions, Motherland receives a stunning visual and visceral design that captures the squalor of this ghetto existence. Kent Barrett’s unit set is crowded with detritus, vividly detailed debris wherever you look. Gregory calls for self-conscious lighting effects to emphasize dramatic moments, provided very capably by David Nail (who doubles as the show’s stage manager). Whether or not it was Aristotle who first said, “If you bring fireworks onto the stage, you must eventually ignite them,” Nail creates eye-popping explosions in light. Dawn C. Shamburger’s costumes are rich in character and class, while Matt Corey provides a soundscape that enlivens Mother’s milieu. The physical production is on par with the best of Florida Stage, FAU Theatre Lab’s precursor. And the play itself, which is pointedly political, will remind many of Florida Stage in its heyday, dedicated at it long was to developing new work that seems destined for a life on the nation’s regional stages. MOTHERLAND, FAU Theatre Lab, Parliament Hall on Florida Atlantic University campus, 777 Glades Road, Boca Raton. Through Feb. 12. $35. 561-297-6124.